First published in November 2003, reviewed for Mystery Ancestor Night January 2014. In the past year or so, I have renewed my interest in finding my roots and organizing my family tree. This has involved a lot of researching of archives and talking to my family. I remember my father mentioning his older brother Gus who died in the First World War, but he knew little about his brother as he was not even five when he died. I set out to find what I could about my uncle and it is amazing what you can find now on the internet. I found much information at the Commonwealth War Graves Commission and the Archives of Canada sites. Pictures of the cemetery where he was buried, his page in the “Book of Remembrance" in the Peace Tower on Parliament Hill and even a picture I can obtain of an E.R. Randall deposited with the archives in 1919 as we have no pictures of him surviving that we can find. Elmore Russell Randall was born in Port Hope on February 16, 1898 and was the third child of Ralph Joseph and Margaret Randall. He moved with his family to Cobourg after the turn of the century to live on the corner of George and Covert Street. They were descended from old area families. His great grandfather John Peros Randall, had arrived in Hamilton Township just east of Cobourg in 1803 and his wife Nancy Ferguson’s family, United Empire Loyalists, earlier by 1799. His grandfather Joseph Maitland was a carpenter in Port Hope, his great uncle Peter, a former Mayor of Port Hope, his uncle the founder of Randall’s Book Store and his father a shopkeeper and later a painter and decorator in Cobourg. His mother, Margaret Stevenson, came from a family that settled just north of Cobourg. He was a member of the 14th Battery for two years in Cobourg before he signed up to join the expeditionary force with the 2nd Division Ammunition Column Canadian Artillery. He eventually was sent overseas to Belgium where on March 30, 1918, the ammunition hut that he and three other soldiers were in was hit by enemy fire. He was the only survivor of the attack but died of wounds a few days later as a prisoner of war. His remains were returned and interred in Étaples Military Cemetery located about 27 km south of Boulogne. On Tuesday, Mr. and Mrs. Ralph K. Randall received an official telegram containing the sad news that their son, 20011076 Gunner Elmer Randall, Artillery, was officially reported to have died of gunshot wounds in the abdomen at No. 20 General Hospital, Camiers. Gunner Randall was 20 years old last February. Upon the out break of war, being ready and willing to do his bit, he tried to enlist in the infantry in the company left here to join the 1st Canadian Expeditionary Force, but was not allowed to do so, as he was under age. Later he signed up in the heavy artillery and went overseas with Lt. Ponton’s draft. He was one of the first two men chosen from this draft to go to France. An older brother, Gunner John Randall, went overseas in the first Cobourg Battery draft with Lt. Col. J. W. Odell. Gunner Randall was employed as porter at the Dunham afterwards at the British Hotel. Besides his parents, he is survived by four sisters and two young brothers, with whom much sympathy is felt, while all citizens regret the death of “another brave Cobourg boy”. Family members have shared many pieces of memorabilia with me; the overnight telegram bearing the news, letters of condolence from Buckingham Palace and the Minister of Militia and Defense for Canada, and a “Dead Man’s Penny”. Luckily, I caught a documentary on the memorial of the Great War which explained the bronze medallion was given to the families of the fallen in the Commonwealth in 1922. Circling the coin is inscribed “He died for freedom and honour". 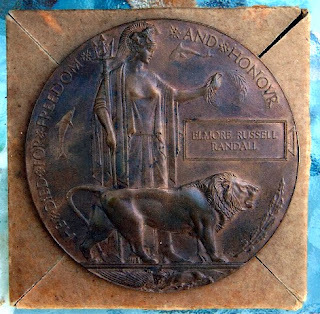 Lady Britannia stands holding an oak wreath above a rectangular tablet bearing the deceased’s name “Elmore Russell Randall”. No rank was included as no distinction was to be made between whose who had sacrificed their lives. The two swimming dolphins symbolize Britannia’s sea power. Below a second lion tears apart the German eagle. The reverse side is blank. 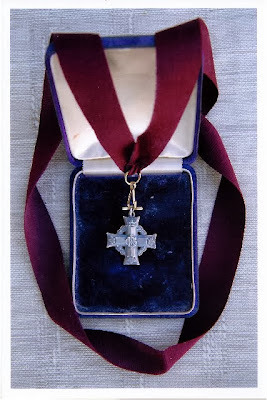 Silver Cross sent to Gus Randall's mother. It was accompanied by a letter from the King. When I attend the service at the Cenotaph in Victoria Park this year on November 11, it will take on more meaning than in past years. My uncle lies in a foreign land in a grave no member of his family has ever seen. No record of his name appears in Cobourg that I have found. 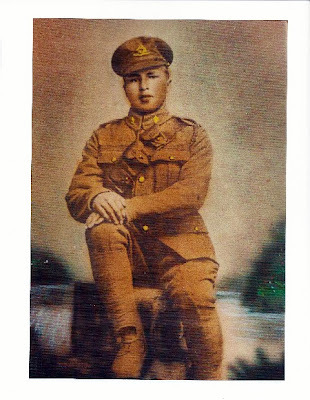 Our family is recognizing his sacrifice by placing a brick in Victoria Square with others of his family and he will always hold a place of honour in my family tree. I am a grateful nephew.